The making of pashmina is a fascinating story. It comprises of the following stages. 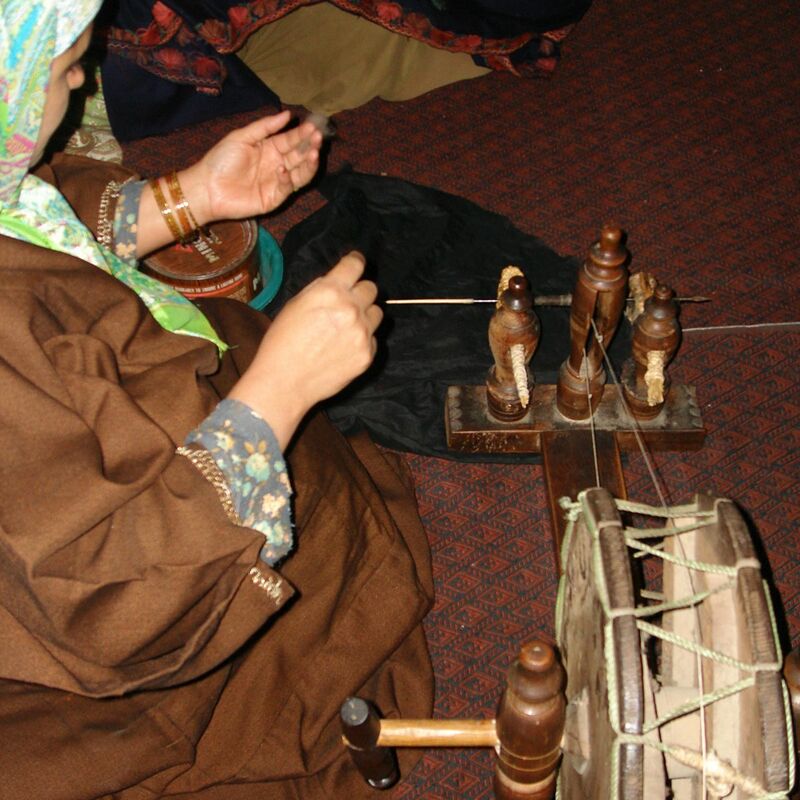 The Kashmiri artisans have perfected the art of hand-spinning fine pashmina yarn. The women in the weaver’s family painstakingly clean and hand-spin the delicate pashm into yarn. 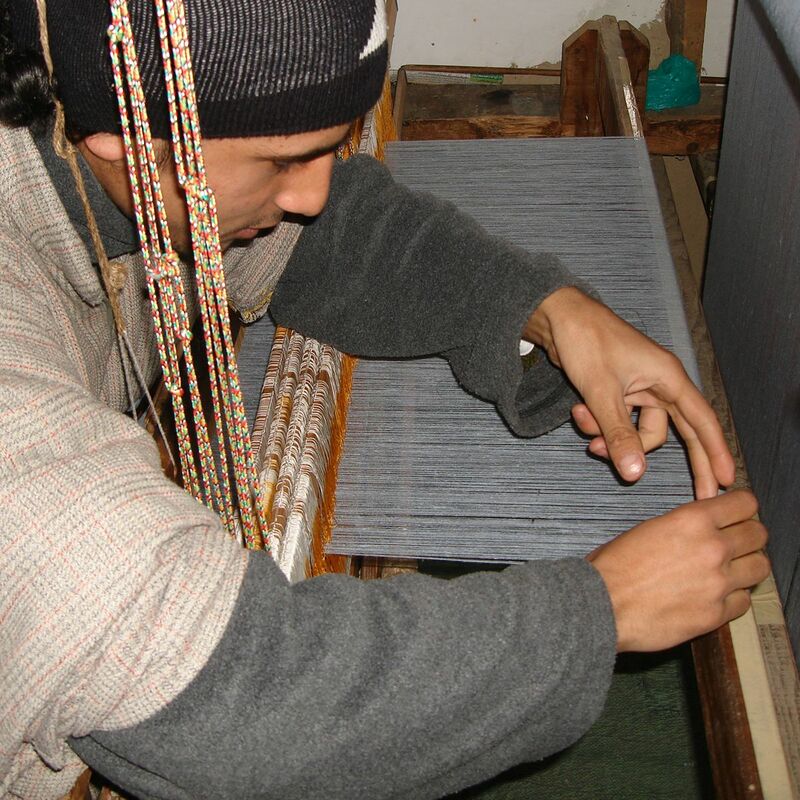 Pashmina yarn is spun entirely by hand and so it cannot be classified into any fixed counts. The fineness depends on the skill and dexterity of the spinner. Sorting ~ fleece is sorted according to quality and length of fiber and physical impurities and guard hair is removed. Washing ~ fleece washed with plain water. Carding ~ Entangled fibres are separated and straightened by manual carding using two wooden combs. Machine carding is also in practice now-a-days. 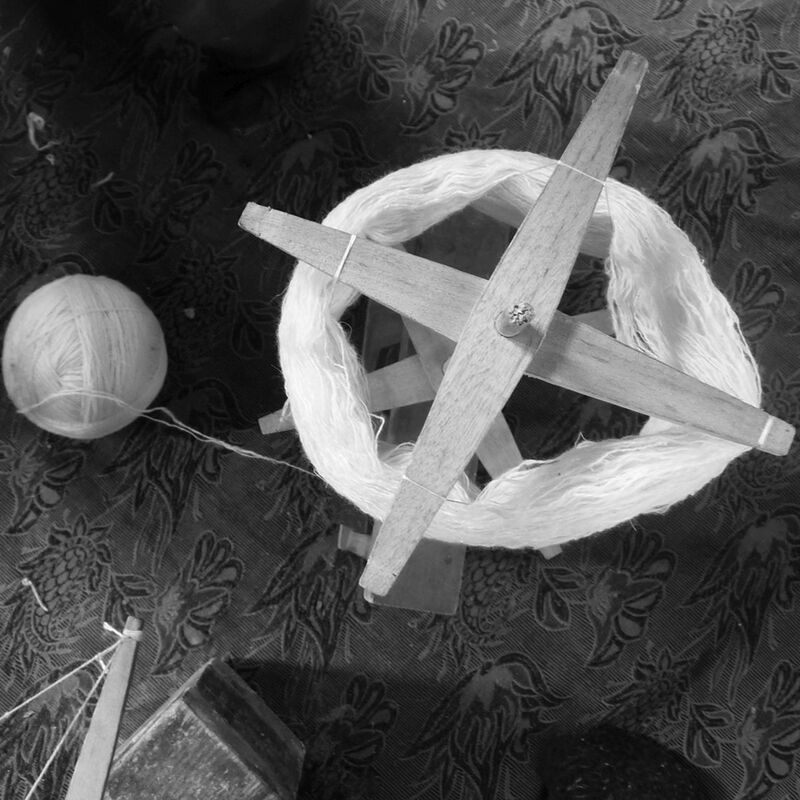 Spinning ~ The untwined carded fibre is spun on a wooden spinning wheel with utmost care to avoid breakages. The yarn has a special lustre due to its long, fine fibres, which are as thin as 14 microns. Sorting ~ The yarn is separated for use as warp and weft. Dyeing ~ The yarn is sent to the dyer or rangrez. The yarn is not scoured as strong alkalis damage pashmina and is only washed with a neutral soap before being immersed in dye baths of copper vats. Sizing ~ To strengthen the yarn, sizing is done by soaking it in a rice starch (anima) or an acacia gum starch (saresh) solution. The hanks of yarn are squeezed, wound onto a prech (stringed wooden frame) and then rewound onto another prech. This is done so that the starch does not form lumps or get stuck to the yarn. It is then dried in the sun. Warp Making ~ Four to six iron rods are driven into the ground at intervals, adding up to the length of the warp. This is called yarun. A long stick with a hook at its end called yarun wej is used to transfer the yarn from the prech to wind the yarn around the iron rods. Two people walk back and forth between the iron rods, carrying a prech in one hand and the yarun wej in the other to wind the yarn. The crossing of the yarn at each turn is very important as it keeps the yarn from tangling. The number of warp threads varies from 1,800 to 2,400 across the width of the fabric. Wooden sticks are placed through the crosses made in the warp, and the threads are spread and manipulated by hand to avoid tangling. These sticks are later replaced with threads, which keeps the cross formation in its place. Now the warp is ready to be rolled onto a wooden beam. 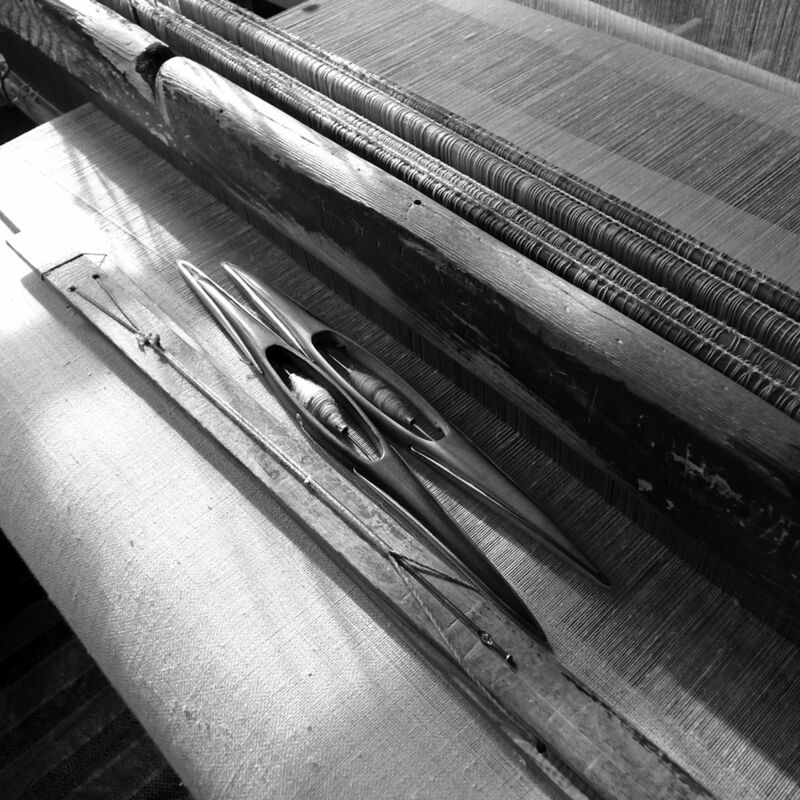 Drafting ~ The prepared warp is threaded through the saaz or healds. The threads are inserted into the loop (heald eye) formed by two thick cotton threads crossing each other. Two people are needed, one to pass the thread from behind and the other to pull it through the loop. The threads are put according to a specific order depending on whether the weave will be plain or a diamond (cheshme bulbul) or twill (saada) or herringbone (maachli gond). Once the warp has been threaded through the shafts or saaz, it is put through the extremely fine teeth of a bamboo reed. Due to the extremely fragile nature of the hand-spun yarn, weaving pashmina is a time consuming process and a 2 metre-long plain shawl takes at least three days to weave. While women are responsible for the spinning, men do the weaving. In almost all the households the entire family gets involved in the making of pashmina. 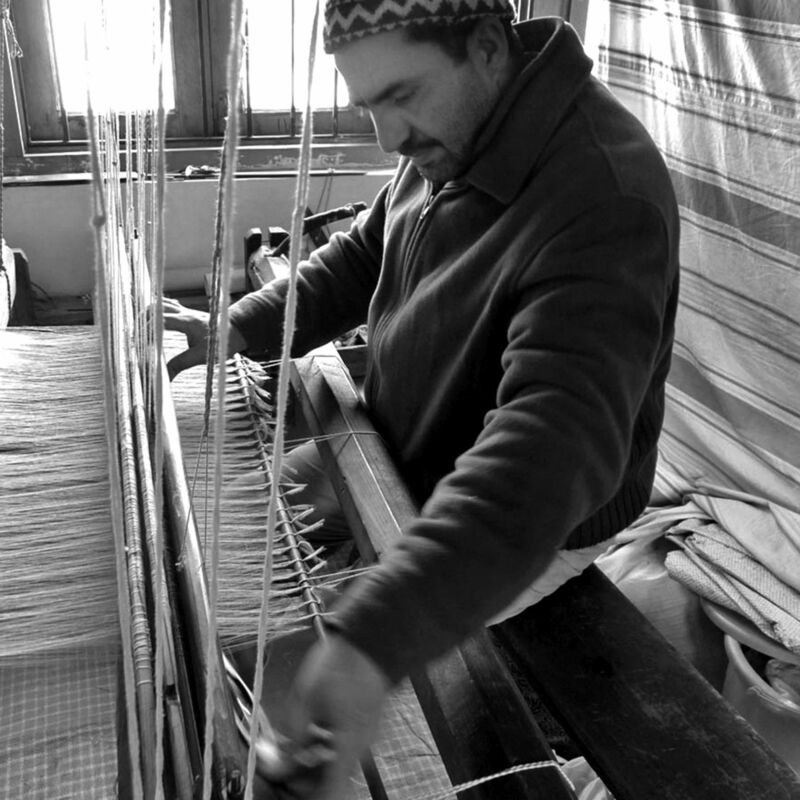 Loom ~ The frame-looms for weaving pashmina are traditionally made of deodar wood. The warp beam, healds and comb are suspended from the frame. The former is attached by a peg and chord to a fixed beam beneath it and this arrangement enables it to be turned as required to let off the warp. The cloth beam is also tightened manually with a wooden stick called taang, which ensures even tension at all times. The shafts are operated in the usual way with treadles. Weaving ~ Pashmina fabric is hand woven gently and the weft is inserted through a shuttle in a throw and catch motion. 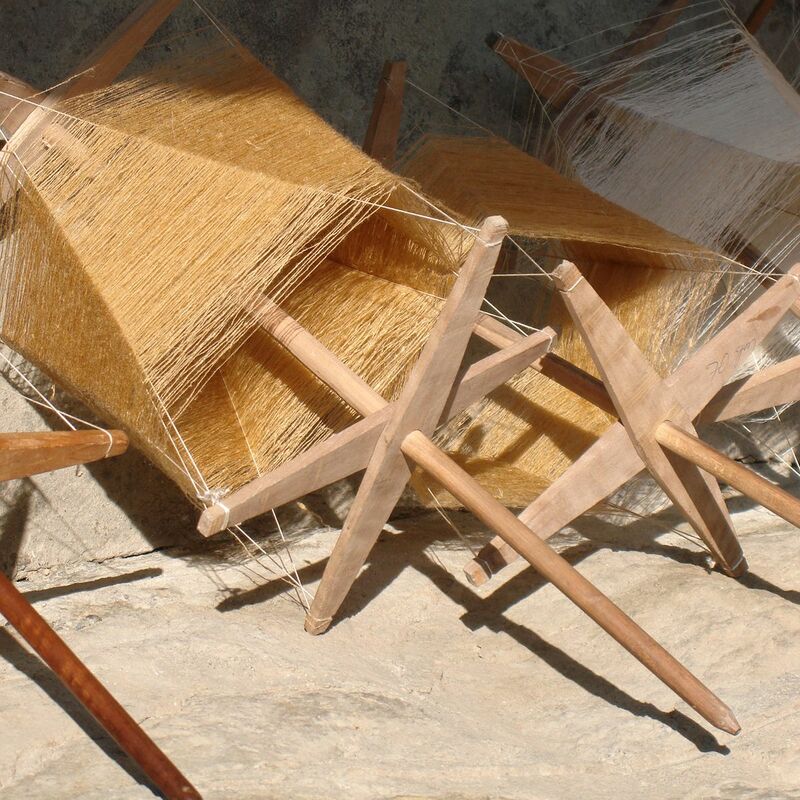 As the hand spun yarn is fragile, it is not possible to use a fly shuttle, as normally used on traditional handlooms. Finishing & Washing ~ The woven fabric is washed with reetha or soap-nut and sent to a purzgar or finisher, who tweezes, clips and brushes it to get rid of its superfluous flaws. The cloth is also scrubbed gently with the dried core of kasher, a gourd known to make the surface smooth and remove any loose fibres. The cloth is then re-washed in running cold water, and struck or stamped repeatedly against a hard surface or stone, to make the fabric smooth and soft. The fabric is wrung in a hand operated spinner after which it is either spread out or hung to dry. It is later sent for calendaring, where it is rolled, stretched and steam-ironed.